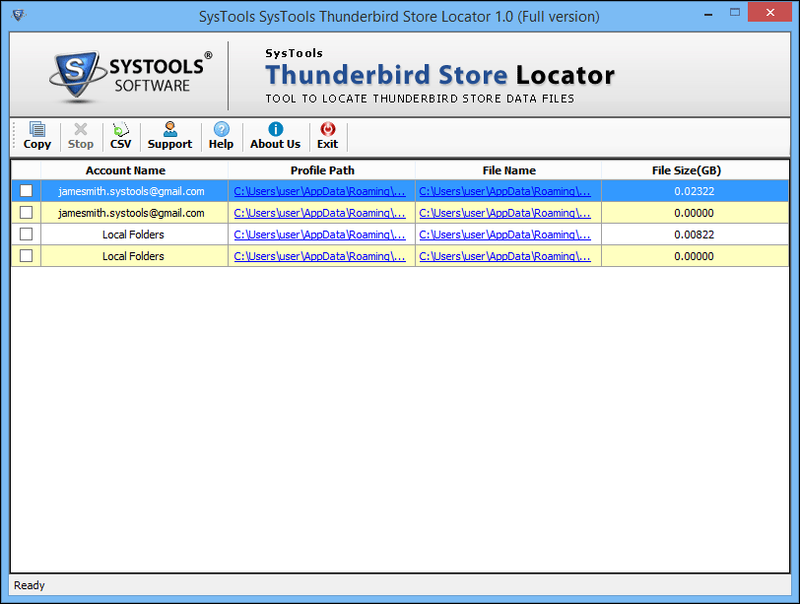 The Thunderbird Profile locator automatically locates all the email folders saved on the computer. It generates a list of all the email folders and displays them. Get the details of different profiles saved on the system. 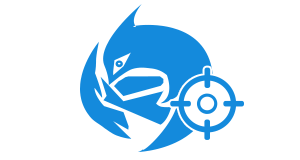 Locate and Save data from email folders of different profiles through a single interface. Option to copy the data from email folders to a different location on the system or on another system. 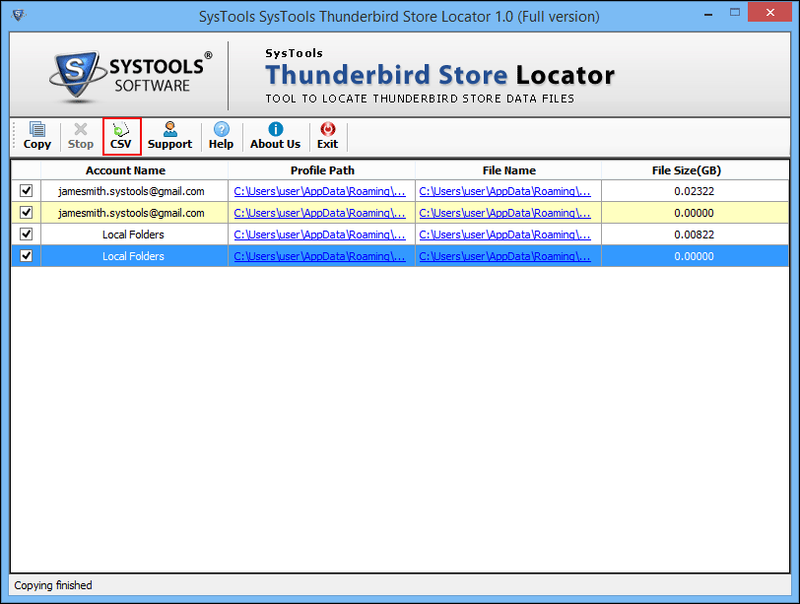 Use the listing generated by the system to locate Thunderbird email files on the system. Backup data from multiple profiles through a single panel. A list of all the folders with their location can be saved in a separate CSV file. Selectively transfer Thunderbird folders to a new computer using this software. Choose to save only a few of the email folders like Inbox, trash, drafts, sent items, etc. One can save just the Inbox folder and leave trash folder. This will save a lot of time and prevent needless saving of data. It will make the process faster and backup of profiles easier. It has a very user-friendly graphical interface that can be used by even a non-technical person. It can backup Thunderbird profile folder easily by clicking just a few buttons. Thereby making the task much easier and simpler. The tool makes managing data from different profiles from a single panel effortless. It well-designed to cater to the needs of business and home users alike. The tool is reliable and relevant as it provides a feature to save the details in a separate CSV file. Once the process of saving Thunderbird profile has been completed, a button named CSV appears on the navigation bar. By pressing this button one can save all the details of the process to a folder location of choice. Verify the process has been undergone successfully by going through this file. It can be used for reference in the future. The tool is efficient enough, that it can work Windows 10, windows 8, windows 7 and all its below versions. It is compatible with both 32 and 64-bit systems. Not much configuration is needed to perform the Thunderbird storage location finding and saving. However, Thunderbird installation is a must on the system where the profiles are located. Can this tool work on Mac operating System? No, the tool can not operate on a Mac operating system. Does the Thunderbird needs to be installed on the computer? Yes, the Thunderbird application is a must to be installed on the user machine. Can multiple Thunderbird profiles be copies using this software? Yes, multiple Thunderbird folders from different profiles can be saved on a different path using this software. Is this Thunderbird Folder Location Detector work with my Windows 10 system? No, the tool does not support Windows 10 currently. Can I save process report using this software? 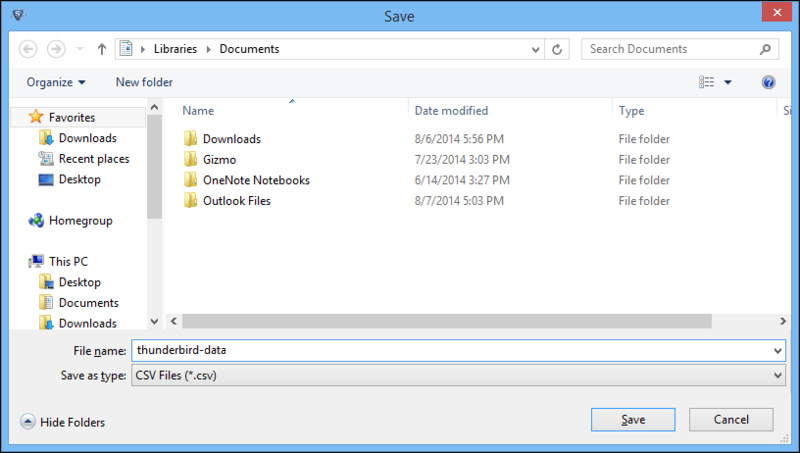 Yes, a CSV file can be saved at the end of saving Thunderbird profile data. Firstly, Launch the application by pressing the Windows key and typing the name Thunderbird Store Locator. Double-click on it to open it. As soon as the software is launched, a list of all the Thunderbird email folders available on the system will be generated. Next, check the box next to the file(s) that need to be copied to another location on the system. Then, click Copy from the navigation bar. After this, a message box will appear indicating that the copy process is completed. Now, the details of the complete process can be saved in a CSV file. 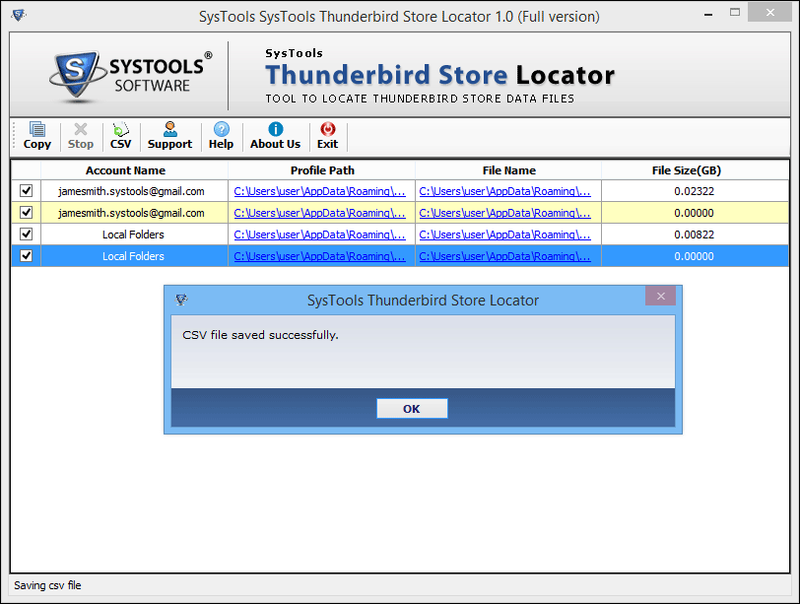 Click on the CSV button after saving Thunderbird profile(s) to another location. Then, choose a folder location of choice and save the CSV file as shown in the image below. Finally, the list of all the details about the tasks completed using this software will be saved. A message box will appear indicating the completion of the process. "This is a brilliant software. I have two Thunderbird profiles saved on my system. I was unable to identify which Inbox.msf belong to which mailbox. Both email folders being the GMail account had the same name for the mail folders. One was gmail.com and the other gmail-1.com. With this tool, I could easily identify which folder belongs to which mailbox." "I am not a very technical person but was still able to use this tool effortlessly. This is the perfect solution for saving my profile to another computer. I have an old Thunderbird application installed on my system. 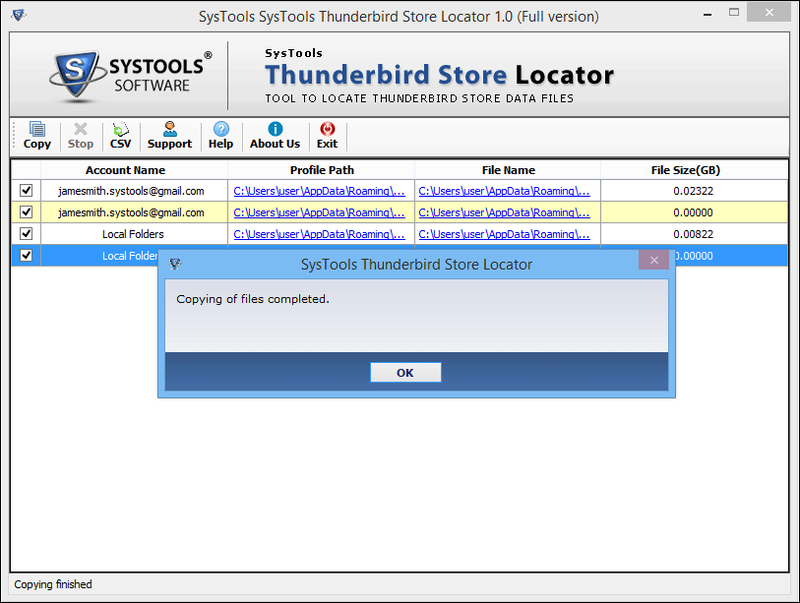 I was looking for a tool that could help me locate Thunderbird profile so that I could install the latest version. Now I can do that easily. Thanks!"